Many operators prefer to progress gradually when introducing a simulator in their trainings. RATP, on the other hand, has done everything at once. Since October 2014, all its metro drivers undergoing initial training work on a simulator throughout the course, which has been revised from A-Z. Wasn’t transforming your training scheme to such a degree rather a risk for you to take? Frédéric Boucher: There was an 18-month preparation period. RATP did plenty of in-house communication, redesigned its entire course, and involved trainers, operators, and others. There were to be no concessions as to the quality of training, and every effort was made to ensure a successful launch. Jean-Pierre Mitchovitch: Making the simulators (one full scope, ten compacts) available ahead of time enabled my department to anticipate and create some 200 scenarios. This meant that training could begin in ideal conditions as soon as acceptance of the equipment had been completed. Another positive aspect was that we had more volunteer trainers than places available! How do your simulators fit into the training course as a whole? Jean-Pierre Mitchovitch: The course lasts 48 days, including some 40 hours on a simulator. 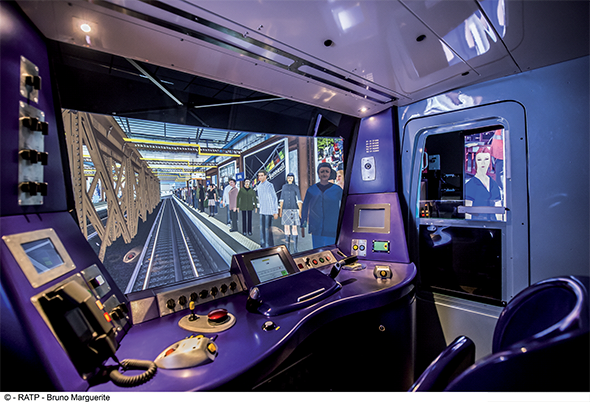 Initially, students use a compact simulator, to find out about the world of the metro as seen from the cabin – braking, traction, driving rules, and so on – before moving on to the fullscope simulator. This is an opportunity to check whether the rules are properly applied when immersion creates a degree of realism and urgency – which can make people forget what they’ve learned. We’re great believers in alternating between theory classes and practice on simulators. The aim is not to train rules experts but people capable of operating professionally in real life. Trainers appreciate being able to create scenarios which were difficult or impossible to implement on practice trainsets: for instance, featuring smoke or a crowded platform. Has the total length of the programme changed? Jean-Pierre Mitchovitch: Theory classes and in-field training with the supervisor haven’t changed. However, we do more practical work than before, earlier on than before: having ten compact simulators makes it possible to learn faster and better than with a single practice trainset. Has the new training scheme delivered the expected results? Jean-Pierre Mitchovitch: Between 200 and 250 drivers undergoing initial training used this equipment in 2014. We’ll need one or two years of experience to do a proper evaluation. So far, though, all the feedback has been positive. Evaluators from management and trade union observers are of the opinion that there’s been no deterioration in driver qualification. Operational staff also say they are highly satisfied with their new colleagues. The trainees have praised the quality of the resources and scenarios. Do you have any advice for other operators thinking of introducing simulation? Frédéric Boucher : It’s important to involve trainers and operators right from the outset, and specify needs in as much detail as possible. Training is a fine art, and that entails a risk of major discrepancies between expectations and what the simulator actually delivers. Jean-Pierre Mitchovitch: One example is that signals some distance away were not visible enough if they were reproduced at actual size. CORYS devised an ingenious solution to the problem using augmented reality: the size of signals is adjusted depending on how far away the train is.